Middle and High School scholars are encouraged to attend RMP's secondary "Excellence Hour" Tutoring Program. Scholars must be registered to participate in tutoring. Seats are limited. All scholars must register at the link: http://bit.ly/ExcellenceHourTutoring. Tutoring will be hosted from 3:30 PM - 4:45 PM. 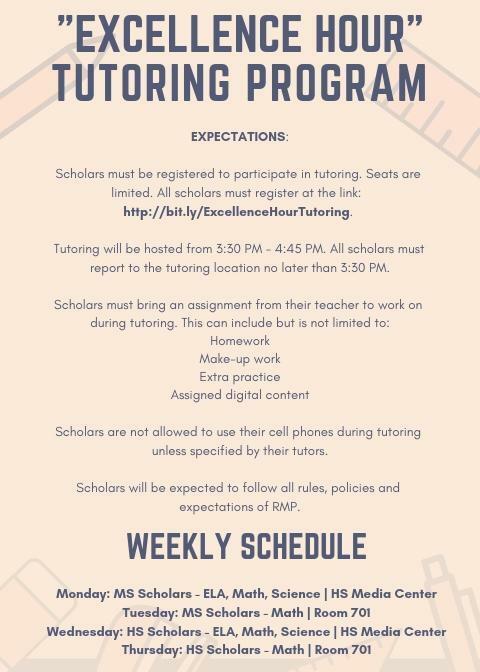 All scholars must report to the tutoring location no later than 3:30 PM. Scholars are not allowed to use their cell phones during tutoring unless specified by their tutors. Scholars will be expected to follow all rules, policies and expectations of RMP. NOTE: Juniors preparing for the ACT on February 20 are able to participate in tutoring everyday up to the test. Our tutors will be eagerly awaiting them!